The second you say the word “wedding” the price on anything skyrockets. Instead, think of it as a great, big party or a reunion, where guests are there to celebrate and enjoy themselves. You don’t have to break the bank to throw a great party. Here are some tips to save money while still keeping your day special and romantic. Have the ceremony and reception in the same place – it’ll save on gas and parking may not be as much of a problem. Ask friends and neighbors if they know an interesting idea for a location. Try areas that one may not necessarily associate with weddings – parks, historical landmarks, a rustic hotel or B&B, can make nuptials both charmingly romantic and unique. You can get donated or gently used items from thrift stores and antique shops and spruce them up with some polish and new paint. Use thrift store-bought silver water pitchers and tea pots as center pieces and vases for table decorations. Have your bridesmaids help polish them as you watch chick flicks and gab about the up-coming day. Or buy an old window frame (with the windows still intact), add a fresh coat of paint, and write the guest list and table numbers on the glass with a metallic pen. It’s creative and a great way to save. Sometimes cutting the guest list is the most effective way to save money. Consider not inviting your second cousin, twice removed on your mother’s side whom you’ve only seen at family reunions or the sorority sister you haven’t talked to in five years. If you and your fiancé are going for a more formal wedding, perhaps only invite adults in the family. Are you and your fiancé from different states and can’t invite everyone? Try an intimate ceremony with immediate family and larger receptions after the honeymoon. Friday evening or a Sunday mid-morning nuptials can cut costs as Saturday is usually a very busy day for weddings. Some vendors even give a discount for off-day weddings. Also, spring and summer weddings can take a chuck of change of your wallet. Contemplate having your wedding in the fall or even in the winter if the heat will bother your guests. Forgo the entrée and you can save hundreds on catering. Buy desserts in bulk (from Smart & Final, Costco, or Sam’s Club, for example) and arrange them on beautiful platters or in nice jars. You can spend about $200 and still have leftovers if you want to skip on an expensive wedding cake. If this is the route you are taking for your special day, make sure it is clearly communicated to the guests that dinner will not be served. Finding a beautiful designer wedding dress can be expensive. To save, consider buying a sample sale dress, or even a dress off the rack. There are also amazing websites to buy previously owned gowns at a fraction of the cost you would pay at a salon. These sites include Wore It Once, Tradesy, Once Wed, and Preowned Wedding Dresses. Remember to ask about alterations, or take your dress to a tailor to have it perfectly fitted. 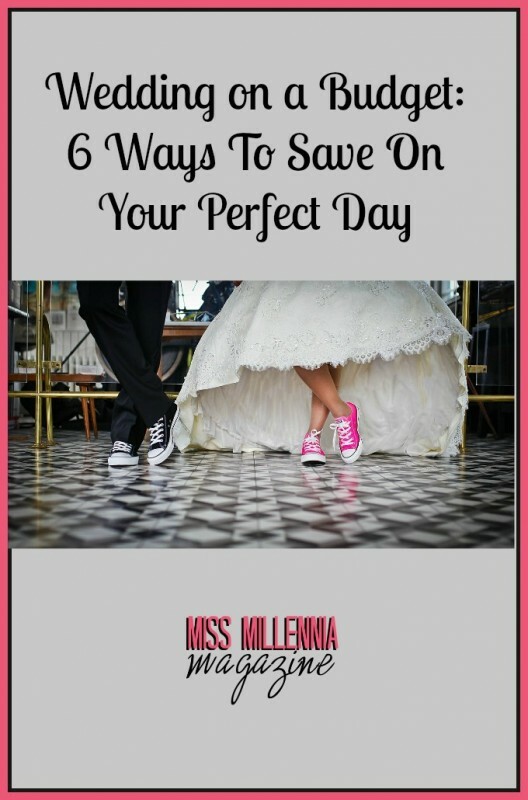 Whatever ways you and fiancé choose to spend and save your money is ultimately up to you, but I hope that some of these tips and tricks help to make your wonderful day unique and romantic without breaking the bank.